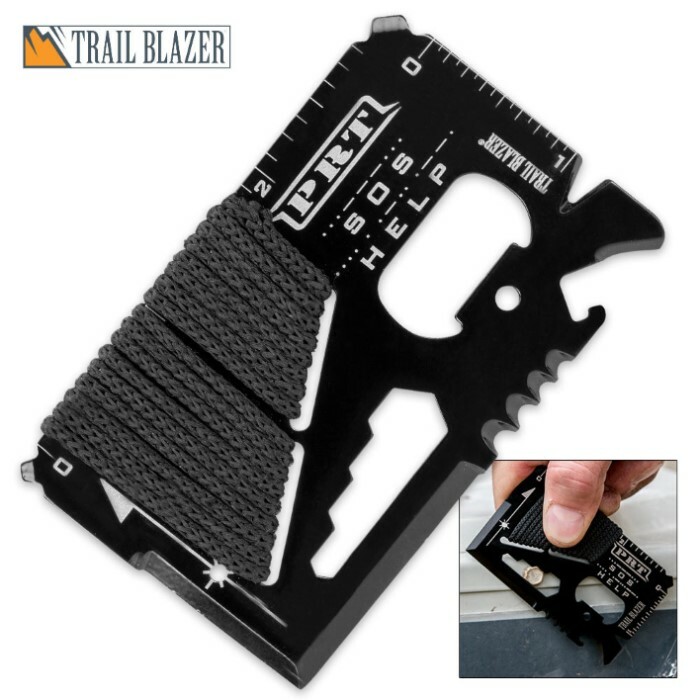 Trailblazer Pocket Rescue Tool / Wallet Card | BUDK.com - Knives & Swords At The Lowest Prices! Multiple emergency tools in one wallet-sized "card"
Unless you keep an emergency kit on your person at all times, it's worthless in a sudden, unexpected crisis. While it's impractical to carry bulky box-sized emergency kits with you all day, every day, with the Pocket Rescue Tool from Trailblazer, if you carry a wallet, you're poised and ready to tackle any emergency, no matter when or where it strikes! 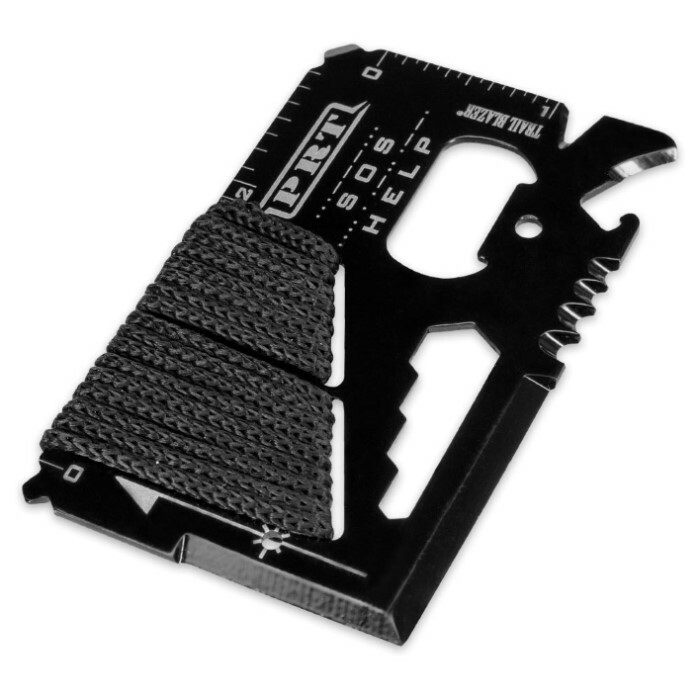 No larger than a credit card, the Pocket Rescue Tool slides easily into any standard wallet card pocket. But don't be fooled by its modest size - this compact tool packs big muscle when it comes to emergencies! 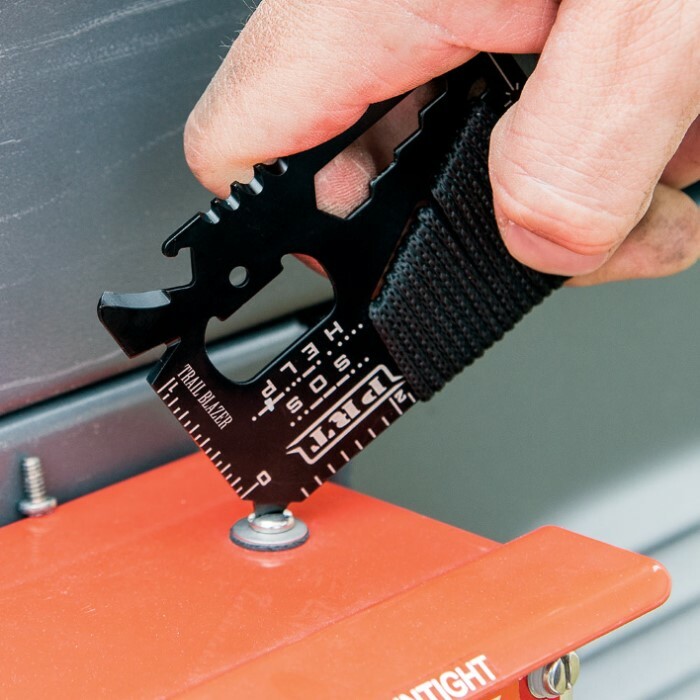 Extraordinarily versatile, the Pocket Rescue Tool includes four wire strippers, four ASE wrenches, a bottle opener, can opener, screwdriver head, emergency cord, knife blade, ruler, and inclinometer in one 3 5/16" wide x 2 1/8" high x 1/16" thick metal "card." Forged from tough, corrosion resistant steel, the Pocket Rescue Tool is designed to perform effectively and without failure in some of the most challenging conditions on the planet. It's not just for emergencies! The Pocket Rescue Tool is also great for a host of everyday repairs or adjustments - loose screws, quick measurements, stray wires and so much more! Don't bet your life or the life of your loved ones on emergency supplies you may or may not have immediately available when disaster strikes. Slide Trailblazer's Pocket Rescue Tool in your wallet, and always be ready for a host of emergency scenarios (or fast repairs! ), whenever and wherever they transpire! Makes an excellent Father's Day, birthday, Christmas or anytime gift! Most of these cards are half the size. So good size and durable. And just fun to use. Got one free with my last order of canned foods. The paracord makes it hard to fit into a bi-fold wallet, but that didn't stop me. The wallet was old and busted anyways. Anywho, this thing is great! sturdy, sharp, and easy to use one-handed -- I've looked at and ignored a lot of this kind of tool that takes two hands to use for some reason. Lost it flying to visit the folks because I forgot it was in my wallet and the metal detector went nuts, but I'll absolutely be buying another one once it's back in stock, and probably a couple extras as Christmas gifts! Just remember to take it out of your wallet before you go to the airport. 9/10, will buy again.